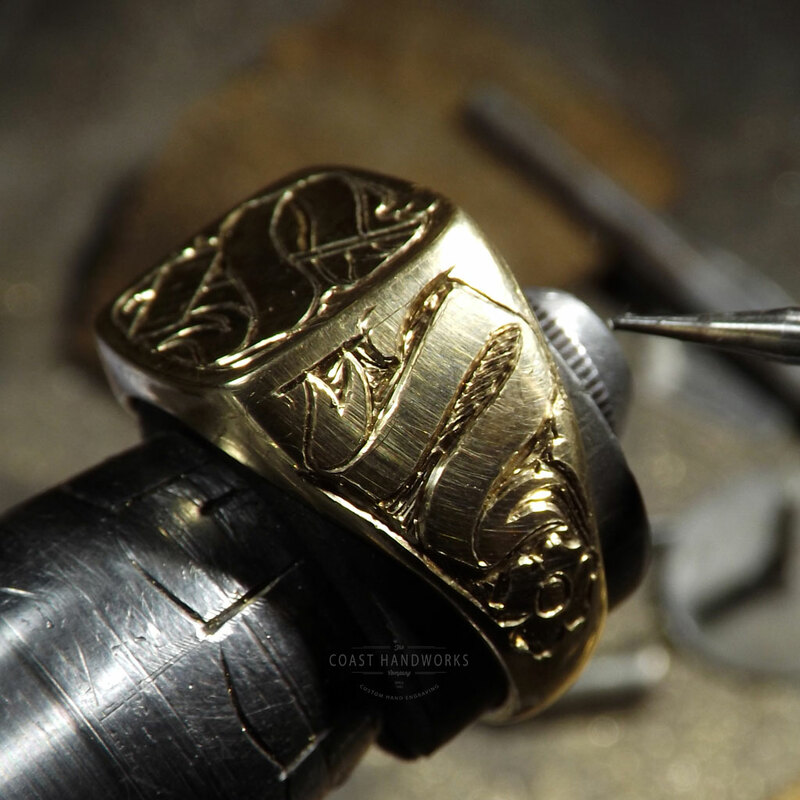 Project Type: Custom signet ring, fabrication, extensive hand engraving of original commemorative imagery and lettering on top and sides. Design Elements: Gavel across the top (owner’s tool of trade), banners denoting a celebratory event, western style buckles as an homage to the customer base in a farm & ranch community. 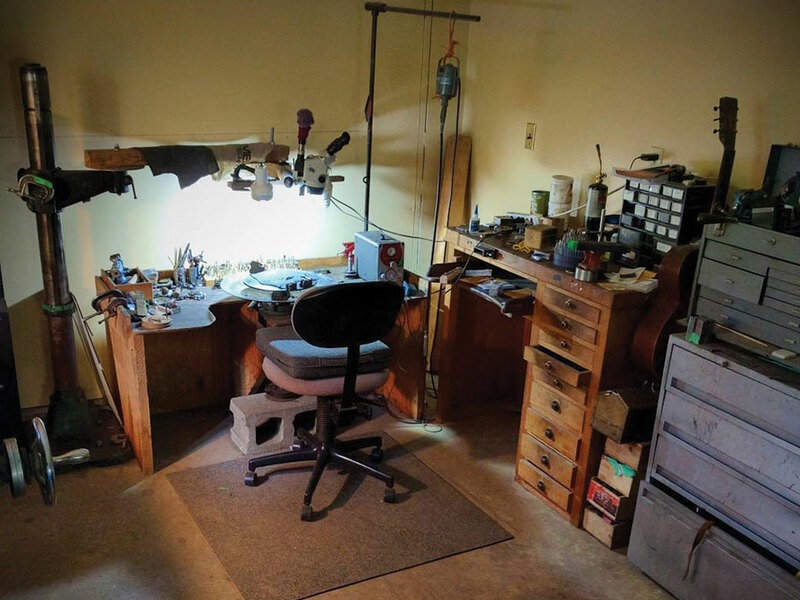 Design Source: Artistic interpretation of customer’s desire to incorporate the various facets of auctioneering in general and the 2nd generation family auction company specifically. 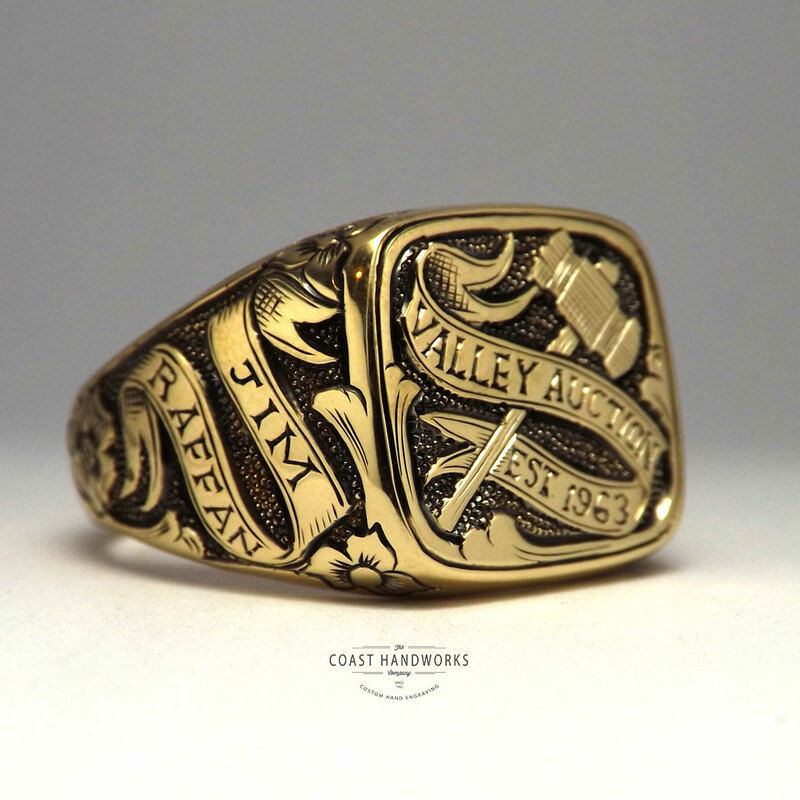 This wonderful customer approached us with no idea as to how to proceed with regard to design except to say she was inspired by our recently completed Cal Poly school ring project. She desired something similar to reflect her husband’s trade of Auctioneer and trusted our artistic experience to flesh out the ideas from there. 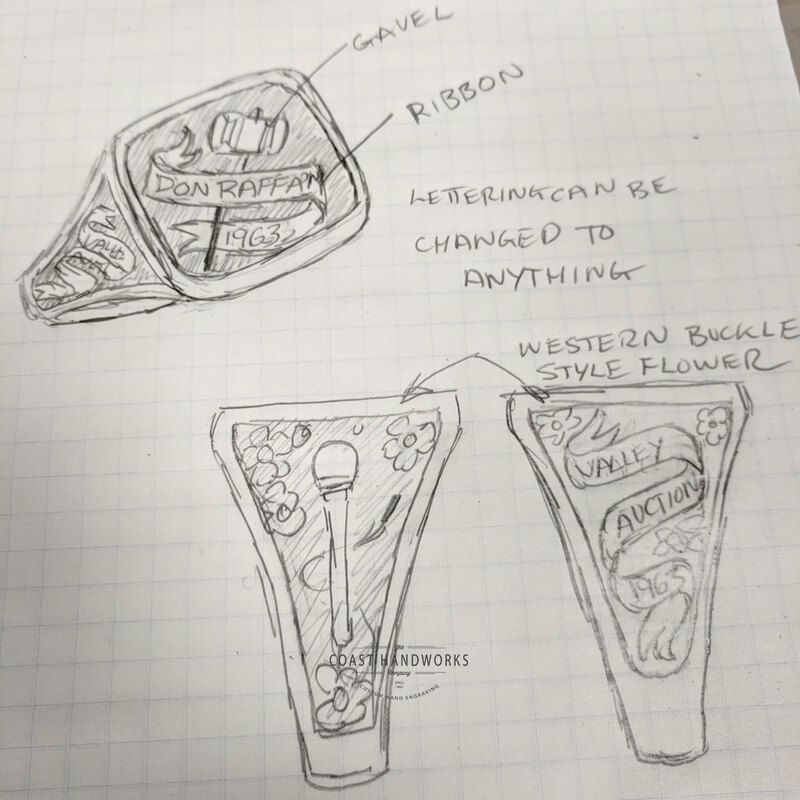 Several versions of the design were sketched and discussed before settling on this unique piece, rich with meaningful visual elements. 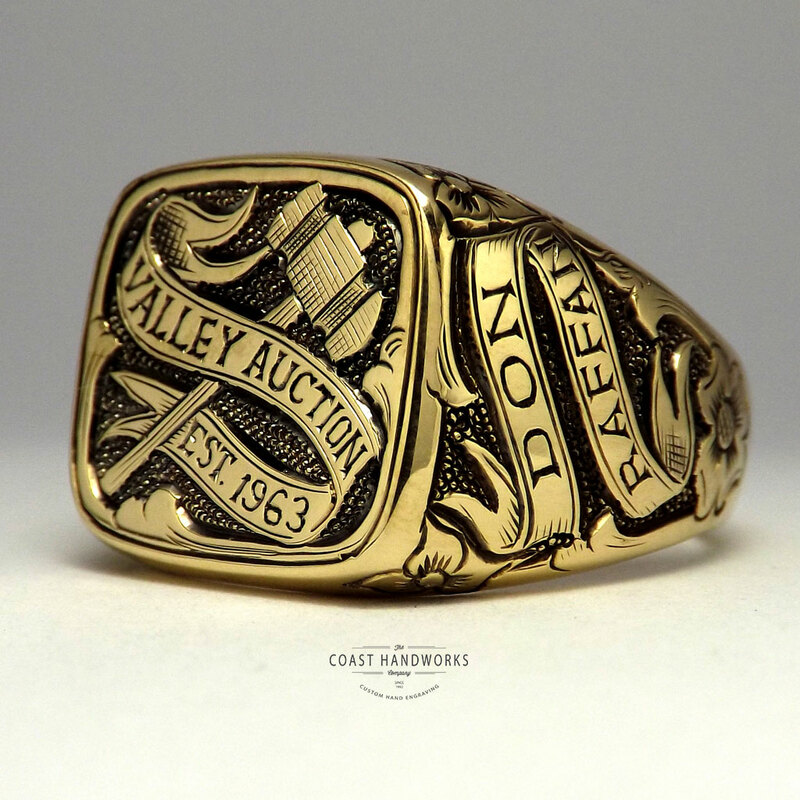 The design celebrates the longevity of a local Auctioneer company started by the father in 1963 and continued by the son to this day, winning a number of auctioneer awards along the way. The Valley Auction Co. started up in our little Okanagan Valley in 1963 and has worked closely with the farming community here ever since. Along the way, auctioneer and community icon, Don Raffan, has won many auctioneering championships. I myself have been to several of his auctions, looking for various items. I was honoured to be commissioned to create this one of a kind ring with so much local significance. Congratulations, Don. We look forward to many more years of your wonderful auctioneering patter! Select this square signet ring model with 2mm top (thickset 3mm top is an option) then customize your order to suit your size, karat, and design wishes. Cost will calculate automatically based on your input. 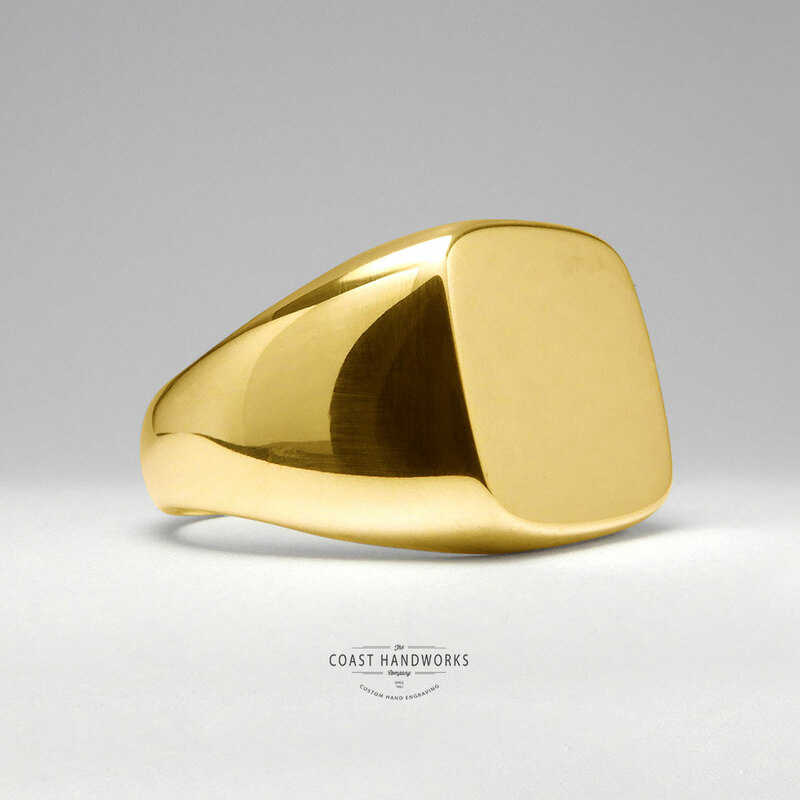 Place a deposit when you’re ready and we’ll start fabricating your ring. 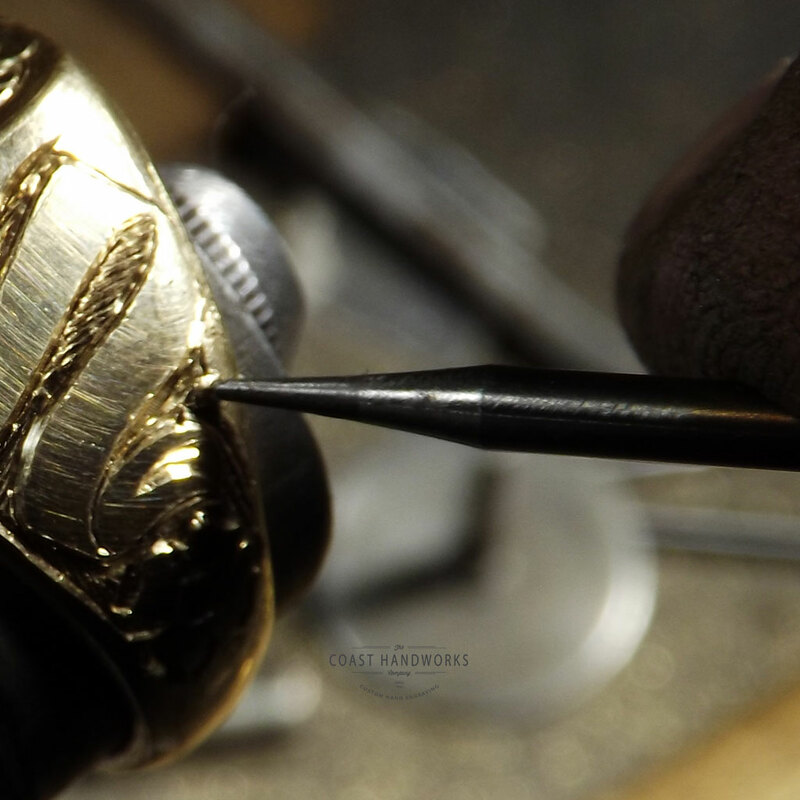 We’ll be in touch with sketches and discussion about your design details to meet with your full approval before engraving it.